Online retailer Wazhome has launched a 500 ml flip-top workout drink protein shaker bottle - the Waz Protein Shaker. The workout drink shaker bottle features a non-slip tapered body, a stainless steel ball type wire whisk mixing wheel, and 3 integrated storage compartments. Australian fitness products company Wazhome announced the launch of the Waz Protein Shaker, a leakproof 500ml flip-top protein shaker bottle. The product is designed to hold and mix workout drinks with three inbuilt storage compartments for multivitamins and snacks. The workout drink shaker bottle is made from non-toxic BPA-free plastic and features ribbed sides for additional grip. The flip-top cap is designed to form a leak-proof seal to prevent spillage or splashes while the bottle is being shaken. 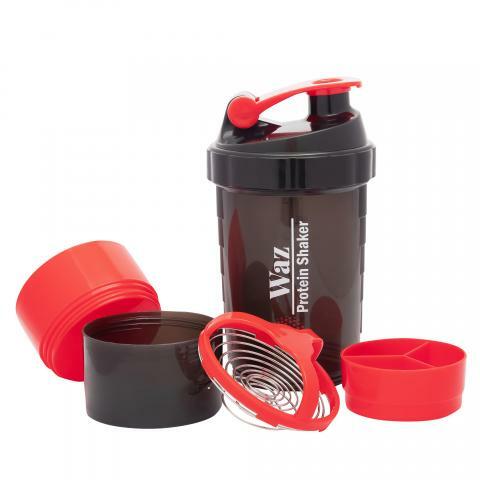 The Waz 500 ml Protein Shaker Bottle is equipped with a unique two-way stainless steel internal mixing wheel that prevents the formation of protein powder lumps and ensures a smooth consistency. The mixing wheel features a ball-shaped wire whisk to improve the dispersion and dissolution of any nutrition powder. The screw-on flip-top lid prevents spills while mixing and pouring. The workout drinks shaker bottle has high-visibility measurement markings and features three versatile storage compartments for supplements, extra powder, and objects as large as a set of earphones, house or car keys. The twist lock and remove compartments also include a partitioned storage box for multiple pills and powders. The Waz Protein Shaker is dishwasher safe and designed with a tapered body that fits into all standard home, gym, or vehicle cup holders. The bottle features a specially designed wide mouth to facilitate the easy addition of powders without rim or overflow spillage. The product’s locking flip-top mechanism keeps liquid or powder contents inside the bottle while in a vertical or horizontal position. Wazhome is an online retailer offering world-class fitness products at affordable prices. More information is available at the URL above.